So, upon landing at his blog and reading a brief description of his new novel, I decided I just had to see what Spell/Sword was all about. The result: an enjoyable read through an unapologetically fast-paced and fun fantasy adventure. Spell/Sword starts out strong and never lets up. Adams flings the reader straight into an action-packed world full of mages, squires, wizards, assassins, pirates and dinosaurs. The story begins with a drunk, young squire named Jonas battling an ogre in a brutal street fight. Jonas is imprisoned for his assault, and from there, we are tossed smack into the middle of a strange and fantastic world. For a Fantasy novel, there’s very little introduction to the story– and I mean this as praise. It was refreshing to read a Fantasy novel without any heavy-handed info-dumping or longwinded, internal dialogue exposition. Adams calls his book the start of a movement– a new kind of Fantasy he calls SWORDPUNK, with focus on the action and adventure of Fantasy. To this end, Adams delivers. Some memorable moments include a bunny piloting a mechanical armored suit, killer frogs on rocket-powered roller skates, and a very vivid description of what comes out of an ogre’s eyeball when you pop it. You’ll find no self-indulgent fluff in this fast-paced adventure, but there’s far more to this story than swordplay and magical battles. Enduring characters with past lives shrouded in mystery will keep you turning the page. Adams brings to life two very real protagonists: Jonas the squire and Rime the wild mage. Jonas’s blockheaded virtue continuously clashes with Rime’s icy, intelligent severity, and their interactions will at times have you laughing, and at others evoke pity for our awkward hero. Adams pulls no punches, and his new adventure will keep you enthralled to the end and eager for more. His claim to have written an “anti-epic” fantasy is accurate, yet without breaking loyalties to the classic mores of the fantasy genre. He writes with a unique voice without straying from the story. Overall, Spell/Sword is an impressive first outing for this new novelist, and I am eagerly awaiting the next installment. 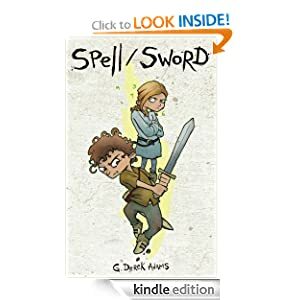 Be sure to visit G. Derek Adams at his blog Spell/Sword, and to check out Spell/Sword on Amazon. Posted in Reading.Tagged adventure, book review, books, fantasy, g. derek adams, reading, spell/sword, swordpunk, writing.